Material for professionals of the photovoltaic die. Sale of smelting furnace for photovoltaic raw material. Realized by a French manufacturer of vacuum furnace with recognized, founded in 1994, based on the co-operation of 3 engineers, having more than 7 years of knowledge in photovoltaic crystallization. This realization is the fruit of this team which designed this photovoltaic furnace, most compact currently existing on the market. This smelting furnace is a tool for crystallization for the production of silicon multicristallin ingots of 240 kg and more, up to 300 kg. A realization innovating required and carried out in order to occupy a minimum of place because of the impressive growth of the die of photovoltaic, but also innovating by its mode of single control of the heat gradient. 1 - Simplicity, safety, effectiveness and profitability. Compact equipment concentrated on the minimal occupied surface (patented). A technological tool for a peak productivity with an excellent return on investment (placement of capital). Can be appropriate for an investment plan or for the realization of photovoltaic field. Loading and frontal unloading ! that is to say an equivalent of 22300 Watts, by ingot. 3 - Annual production capacity. allowing the realization of 15156 photovoltaic solar panels of 200 Watts / Year, made up each of 96 cells of 2,1 Watts each one. - to make it cut out in wafer. - to assemble Wafer in photovoltaic solar panel. (An ingot makes it possible to carry out to 110 solar panels of 200 Watts made up each of 96 cells). 4 - Installation and site. This photovoltaic furnace from its compactness, implies an easy approach of the connection of the fluids. 5 - Exploitation of the furnace and production process. The process is entirely automated by PLC, and is supervised and controlled by means of computer by an application software developed by the manufacturer. The software installed was already evaluated on more than 100 models different of furnaces, designed by the same one and single manufacturer. This software makes it possible to visualize the graphics of the stage of the evolution of the process, to record the data in real-time in a file, as well as the storage of files, being able to be used in particular to make data analyzes. The modular concept allows the fast replacement of the internal elements in the event of intervention on the various components of the furnace, and a fast visual monitoring. 6 - Principal features of the photovoltaic furnace. Is appropriate for ingot with standard dimensions of 68 cm. x 68 cm. x 25 cm. to make ingot multicristallin of 270 kg silicon. Cycle time per ingot of polysilicium of 240 kg : less than 50 hours. 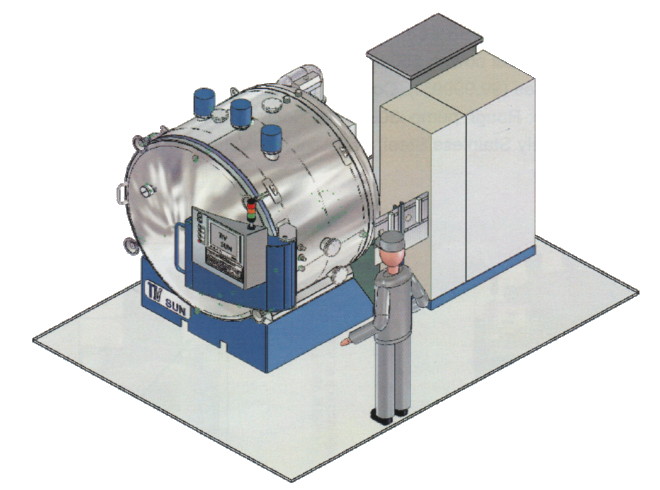 Stainless steel room with double wall water-cooled of a volume of 3 m� approximately. it is put vacuum by a primary pump of a capacity of 300 m�/hr and of a ROOTS of 1000 m�/hr. - a �casing� insulated inside, the interior of the enclosure is equipped with a manual door. and resistances partly lower of a power of 50 kW. That is to say a total of 150 kW. The lower part comprises 2 actuated shutters each one by a motor bike reducer. It is the photovoltaic furnace most compact of its generation. It is advantageous by its simplicity, its automatism and it is equipped with multiple points of safety for the user. 7 - Volumes and loading. Maximum load capacity: up to 300 kg (240 kg of silicon and 300 kg with the crucible). 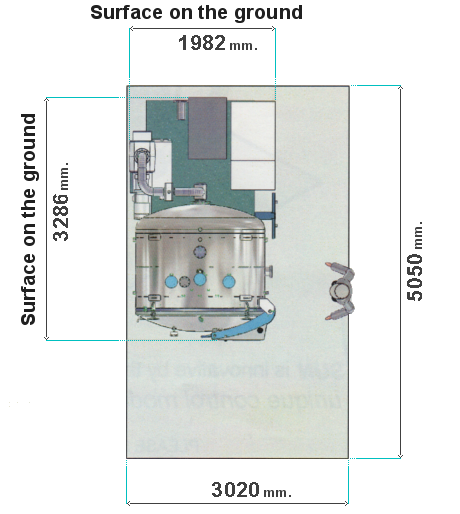 The entire surface from site to be envisaged, closed furnace, 2,1 meter X 3,5 meter is lower than 7,5 square meter. Total height of the equipment : 2,45 meter. 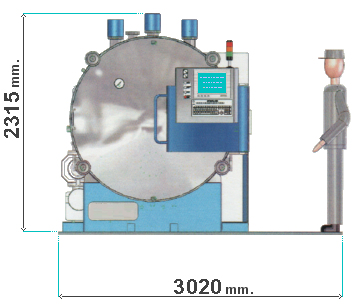 Total mass of the equipment in the course of application : 5000 kg (5 tons). The procedure of loading/unloading is carried out by a specific loader, adapted as shown on the photographs present. 8 - Displayable points of safety by the user. This patent was deposited by the manufacturer of this photovoltaic furnace. It even makes it possible to use silicon ingots �having been missed�. We could produce ingots without problem and any incident. The concept of this photovoltaic furnace as realized by its manufacturer is that in the case of overflow or of rupture of the crucible, silicon in fusion does not have any other possibility but of remaining within a partly cold limit, enabling him to crystallize. The risk of explosion is always existing in the furnaces of production of silicon ingot. 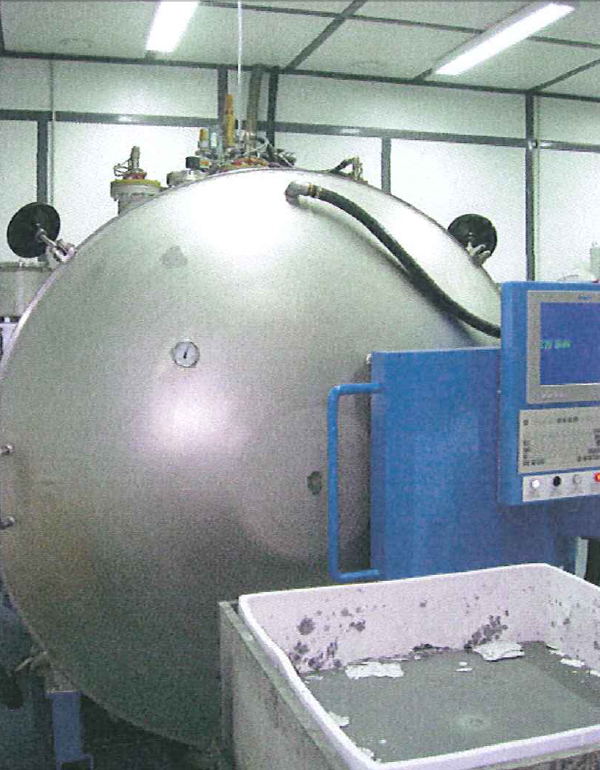 This arrives when there is a rupture of the crucible causing a flow of molten silicon reaching a wall of the furnace, the latter being doubled for the passage of the coolant circuit to water. The explosion arrives by thermal shock occurring between silicon in fusion and the metal wall inside which the water circuit playing passes its part of cooling. This phenomenon starts also a great quantity of steam, but can also oxidize part of beforehand molten silicon, causing a pressure so strong which it is higher than the bearable limits of the photovoltaic furnace. Here how the explosion of a photovoltaic furnace occurs. This type of risk of explosion is impossible with this photovoltaic furnace because of its design which has a site entirely containing the ingot of silica and preventing it in this direction of this risk of molten silicon overflow. The whole of silicon being entirely contained in its site without possibility of overflow. - of oversize anti-explosion valve compared to the standard. In the event of steam making its appearance, water runs out by the lower part of the furnace. Water cannot thus stagnate indefinitely, it evacuates by the bottom of the furnace, moreover, the high temperature of the furnace puts an end to the appearance of the steam has just been evacuated. 9 - Information of the manufacturer. Our form present at the foot of the page enables you to transmit to the manufacturer, your request for price, according to the number of desired specimen. 10 - Operation of the photovoltaic furnace. In automatic mode, the operator starting from the supervision, selects a sequence then the order. In manual mode, the operator starting from the supervision, selects a function then the order. The stopping of the furnace is ordered starting from the supervision or by pressing the pushbutton GENERAL STOP. Only one operator works on the smelting furnace. 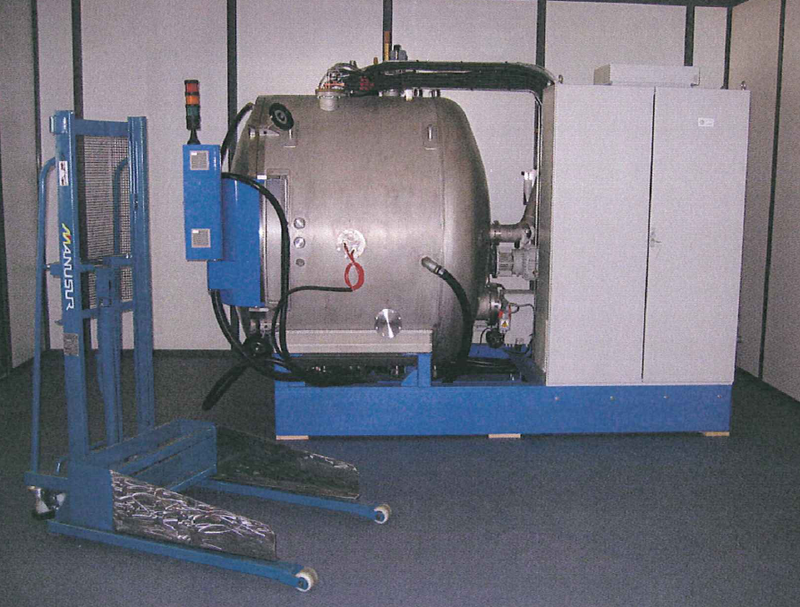 The operator carries out the operation of loading of the silicone crucible using a specific industrial truck. The operator orders the furnace, the process of fusion, the process of crystallization. The operator carries out the operation of unloading once the finished cycle. 11 - Startup of the photovoltaic furnace. - After the closing and the control of the locking of the door. - One carries out a vacuum of 1.10-2 mb using the pumping installation to vacuum. 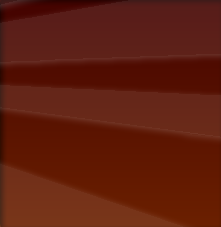 - The gas argon is injected into the furnace until a pressure from 300 to 800 mb absolute. - The enclosure of the furnace comprises a spill valve calibrated at 5 PSI as well as an anti-explosion valve. according to a strategy related to the PLC. - Resistances partly low comprise a thermostat cabled on a regulator of safety regulated to 1580�C which cuts the contactor of heating. - The regulators comprise an access code. - Each of 3 electric connections of high and low resistances comprise a gauged thermostat with 70�C which cuts the heating. very slowly and do not present a risk. 12 - Form of contact for this photovoltaic furnace. The royalties of this site are recorded in front of notary.